74 years, 8 months, 6 days old age. Gopal Krishna Goswami will turn 75 on 14 August, 2019. Only 3 months, 24 days, 12 hours, 3 minutes has left for his next birthday. Gopal Krishna Goswami has celebrated the total number of 74 birthdays till date. See the analysis by days count and bar graph. Gopal Krishna Goswami Maharaja popularly known as Hare Krishna was born on the most propitious day of Annada Ekadashi, on 14-08- 1944 in New Delhi, India. 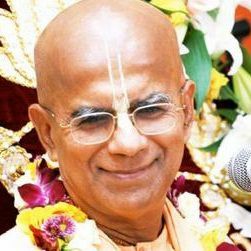 He was the first Indian follower of A.C. Bhaktivedanta Swami Prabhupada to be commence after the establishment of ISKCON. H. H. Gopal Krishna Goswami Maharaja after completion of his graduation from the University of Delhi, went abroad for Management Studies at the Sorbonne University of Paris. He did this through a scholarship which was awarded to him by the French Government. Then he went for a higher degree in Business Studies from the McGill University at Montreal. In 1981, Gopal Krishna Maharaja decided to take the Sannyasa order. The following year in March 1982, on the favourable day of Guru-Purnima, Goswami Maharaja decided to become a ‘Diksha’ guru. He was the sole founder the Mid- day meal being organised at the ISKCON Temple Delhi. Currently this initiative is serving 1, 75,000 meals daily, feeding hungry kids of Noida, Delhi, Kurukshetra and Faridabad. The initiative will soon advance by connecting adjoining areas and various other cities would come under the scheme. United Nations - World Food Program has admired this virtuous initiative and has agreed to provide technical backing. The Government of India also appreciated these noble efforts and the many State Governments across nation want to improvise this project to other cities of their respective States.